Preheat oven to 350°F. Grease and line four 7” round pans. Mix together all dry ingredients (flour, cocoa, baking powder, sugar, and salt) in a stand mixer on low (with a paddle), until fully combined. Pour in egg whites, and mix on low until just incorporated. Mix in the buttermilk in two installments, on a low speed. Add in vanilla and oil, and mix at a low speed until fully incorporated. Scrape down the sides of the bowl with a spatula, then beat on medium high for about 30 seconds. Divide evenly between the prepared cake pans. Bake for 35-40 minutes, or until a skewer comes out clean. Allow to cool for 10 minutes, then run an offset spatula around perimeter of the pan to separate the cake from the pan. Place cake layers on a rack to finish cooling. 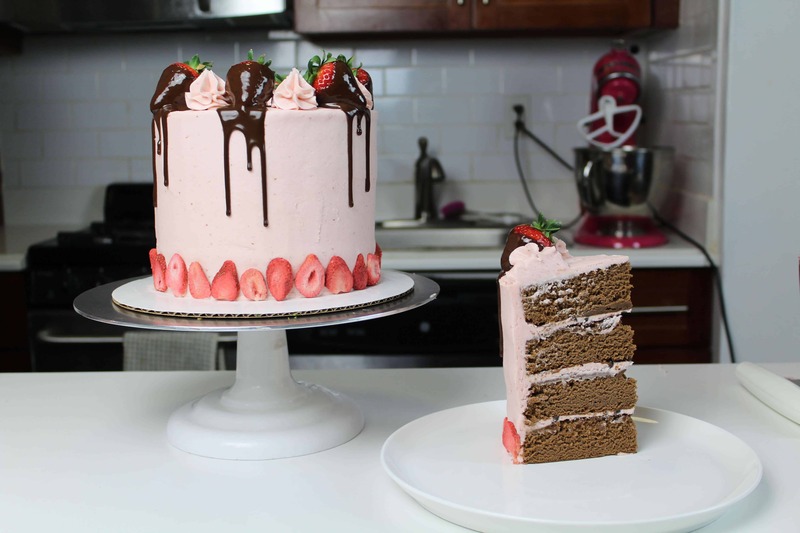 While the cake layers cool, prepare the strawberry puree for the frosting. Puree 1 cup of strawberries in food processor, then pour into a pan over a low medium heat. Stir frequently, and cook for roughly 20 minutes, until the puree has reduced in size to half it’s original volume. Remove from heat and place in fridge until fully cooled. Next, make the strawberry buttercream.Beat the butter on high for 30 seconds with a paddle attachment, until smooth. Slowly add in the powdered sugar, 1 cup at a time. Alternate with small splashes of cream. Once fully mixed, add in the vanilla and salt, and beat on medium low until the ingredients are fully incorporated. Mix in (fully cooled) strawberry puree. If the frosting is too thick, add in cream (1 teaspoon at a time). If the frosting is too thin, add in more powdered sugar (quarter of a cup at a time). NOTE: When making frosting for a cake, it is important to mix the buttercream on low at the end of the process for a couple minutes, to get out any extra air that might have be incorporated during the mixing process. This will make it easier to get super smooth sides on your cake! For the chocolate ganache, heat heavy cream in a heat-proof bowl in the microwave for 45 seconds to 1 minute, until gently bubbling. If you don’t have a microwave or prefer to use the stove top, you can heat the cream over a medium heat in a pan until it begins to simmer. Remove from heat and pour into a heat-proof bowl. Gently pour chocolate chips into the heavy cream, making sure they are fully covered with cream. Allow mixture to sit for 2 minutes. Stir slowly until the cream and chocolate are fully combined combined. Set aside to cool for about 30 minutes (or place in fridge for about 15 minutes), then pour into a squirt bottle for easy application. Once the cake layers are fully cooled, assemble the cake. Stack and frost layers with buttercream. Apply a thin crumb coat, and chill the cake in freezer for 5 minutes. Once the crumb coat is firm to the touch, apply, a second, thicker coat of frosting. Smooth with a bench scrapper. If you want to see a full tutorial for how I get smooth sides on my cakes, you can click here. Place cake in freezer for 15 minutes. Once the cake is fully chilled, remove from freezer. Dip washed strawberries into the ganache, and place around the the top edge of the cake, leaving about 1.5 inches between each strawberry. Allow some of the ganache to drip over the edge. Use a squirt bottle to add the ganache drips to the areas where the strawberries are placed. And that’s it!! If you want to learn the tips and tricks I use to add drips to a cake, you can see a full tutorial here. 7 inch round and 2 deep? Frosting question- I’m Canadian and don’t know how much a stick of butter is. On your Taco Cake you use 6 sticks saying it’s equal to 2 cups. On this one it’s 4 sticks equals 2 cups. I’m pretty sure one of them is a typo. Which one is it? For the record your fb live has become such an enjoyable part of my Wednesday evening. Thank you! Hi! Can I use that cake batter to make a giant cupcake? Honestly, I’ve never tried that so i’m not sure! so sorry! Hi there! What is 1/8 cup of vegetable oil? Is that only 2 tablespoons? I made this for a baby shower last weekend. It was a huge success. Thanks for sharing. Hey! So I only have one 7in cake pan. Do you think the batter will be ok sitting around waiting to go into the oven while I bake each layer separately? Should I refrigerate it? The ingredients should be room temp, so putting the batter in the fridge prob isn’t the best idea! It’s not ideal to let the batter sit for extended periods of time, but it won’t go bad! It just might rise a little less than normal. This cake is pretty dense in the first place though (it’s a butter cake base), so it should still turn out!! IF I ONLY HAVE TWO PANS DO YOU THINK IT WOULD BE OK THAT AS SOON AS TAKE THEM OUT OF THE OVEN I PUT THE OTHER 2 IT WOULD NOT HAPPEN ANYTHING IF THE OVEN IS TOO HOT? yup! I think that would work fine! Could I use strawberry jam instead of fresh strawberries? If so, how much jam should I use? Hi there, I am making this today for my mom’s birthday. You said to use the paddle but in your video you are using the whisk. Does it matter? thanks! For the buttercream can I use salted butter and not add the extra salt? Can you use 8in cake pans instead? yup, but I’d recommend making 3 layers! !